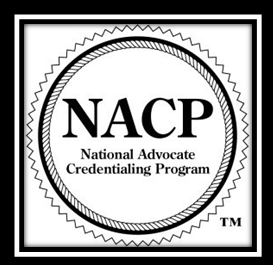 Any program providing Introductory Victim Advocacy training may submit its curriculum for pre-approval by the National Advocate Credentialing Program (NACP) as meeting the minimum standards for a basic advocacy training. Your training must include a minimum of forty (40) hours and all of the basic or foundation level topics listed below. We understand that some topics will be covered throughout the training or within a module with a different topic heading. If your training program meets all of the criteria, the program will be included among the other NACP pre-approved forty-hour training programs and will be added to the list of NACP Pre-Approved Training Programs. The training will be listed as it appears on this application unless you tell us otherwise. When available, the NACP list will include a link to your training website. Deadlines for Submission of Applications: April 1st – 30th and October 1st – 31st. *Please contact us if you need an expedited review. Please be advised that all trainings pre-approved by NACP prior to August, 2016 will be grandfathered in and will not need to pay this fee. However, ALL NACP Pre-Approved Training Programs will be asked to complete and submit this form for our records. The status of each training program will be verified and/updated during our renewal period every two years thereafter. Renewal of your training’s Pre-Approved status is at no cost to you providing the training is maintained at the minimum requirements (40 hours including the 10 core topics) and a renewal application update form is submitted every two years. Failure to renew might result in your program being removed from our pre-approved training list, a re-assessment of your training program and an additional review fee. Please Note: If your program does not meet the NACP criteria, the NACP Review Committee will work with you to ensure your training meets NACP minimum standards. If your training does not meet the NACP minimum requirements for pre-approval or if you choose not to work with NACP to bring your training up to the minimum standards, a portion of your fee will be refunded. Successful graduates of NACP pre-approved training programs will be eligible, at minimum, for the Provisional credential. Interested training program coordinators should submit their program’s curriculum with the completed training pre-approval application to NACP for review and approval by email to credential@thenacp.org.